Hey all! Its Cassafrass here *waves* So I never actually posted a review on the blog yet, so I thought I should get around to it! Now I dont really know how to do that fancy HTML stuff Belle does... So Im going with good old Copy/Paste. 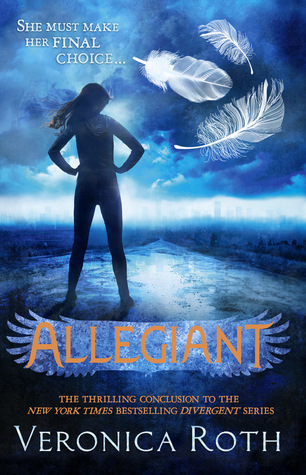 XD If you want to read my review including spoilers (It looks a bit empty without them..) , check out Allegiant Review . Thanks for bearingg!! *sheepish grin* Ill learn all this tech stuff soon enough! This is the much dreaded ending. First of all, I want to say that I didn't cry, MUCH to my surprise.. but before going in depth on the ending, I would like to talk about the rest of the book. 2. Four/Tris' relationship lacked a bit here in my opinion. I can't really phrase how to say it, but it seemed to me that whenever she was with Four (I love calling him Four) was either trying to get his shirt off, or they weren't talking because disagreements/fights. *counts off fingers* I think that's it.... I really cant talk about the ending without giving anything away, but overall, although I think it isn't the best book ever, the ending was phenomenal and definitely the best wrap up written for the series. (Not that I appreciate it. I've got my eye on you for the future, Roth. *narrows eyes* :P) Good job, though. I mean it. And personally, I think making Allegiant into two films is unneeded.